This paper examines admissions for the last ten years for those recorded as of no fixed abode (NFA) on the National Psychiatric In-Patient Reporting System (NPIRS). The Health Research Board’s (HRB) NPIRS data were analysed using SPSS to develop an overview of admissions with NFA recorded for the years 2007-2016 (n=2,176). In the period 2007-2016 there were 2,176 admissions with NFA recorded. In that 10-year period there was a 44% increase in admissions with NFA from 188 in 2007 to 271 in 2016. The analysis shows that the characteristics of this cohort have remained largely unchanged in the 10 years; almost three-quarters (1,598; 73.4%) were male, almost half (1,068; 49.1%) were less than 35 years of age and three-quarters (1,638; 75.2%) were less than 45 years. Three-quarters (1,643; 75.5%) were single and a similar proportion was unemployed (1,640; 75.4%). In addition, the highest proportion had a diagnosis of schizophrenia (621; 28.5%) followed by drugs/alcohol disorders (590; 27.1%). These characteristics are consistent with the single ‘chronically homeless’ people described in the literature. The paper concludes the need to use routinely collected data to help understand and address the need of specific homeless sub-groups particularly those on institutional circuits that include psychiatric in-patient facilities. To enable this it recommends the implementation of the individual health identifier as a matter of urgency. Prior to the introduction of Pathway Accommodation and Support System (PASS), data on the extent of homelessness nationally, and the characteristics of homeless people came from periodic assessments of housing need conducted by local authorities, and cross-sectional survey data, primarily carried out by NGOs. Data generated by the PASS (Pathway Accommodation & Support System), a national bed management system for homelessness services allows for a monthly report on the number of adults and child dependents in designated homeless accommodation, starting in mid-2014 and broken down by gender, age, and nature of accommodation. Routinely collected administrative data such as PASS can help to generate a picture of those who are experiencing homelessness in the Irish population. Routinely collected data on those who are homeless is also part of the National Psychiatric In-Patient Reporting System (NPIRS) which gathers data on admissions to and discharges from psychiatric hospitals and units and includes data on those of no fixed abode (NFA). These data have been collected since 1963 and since 1971, NFA has been recorded. While not a dataset on homelessness per se, the NPIRS system can provide some insight into the use of psychiatric in-patient services for those recorded as NFA. PASS data show a 152 percent increase in the number of adults (singles and families) in designated temporary and emergency accommodation between June 2014 and November 2018 nationally, from 2,385 to 6,157 adults. Nationally, the relative number of single adults utilising temporary and emergency accommodation has declined from 82 percent to 61 percent. However, the absolute number increased from just under 2,000 in April 2014 to 3,874 in November 2018. Roughly three-quarters of these single adults were male in November 2018 – a figure that has remained stable since the PASS data collection system was initiated (see Figure 1). 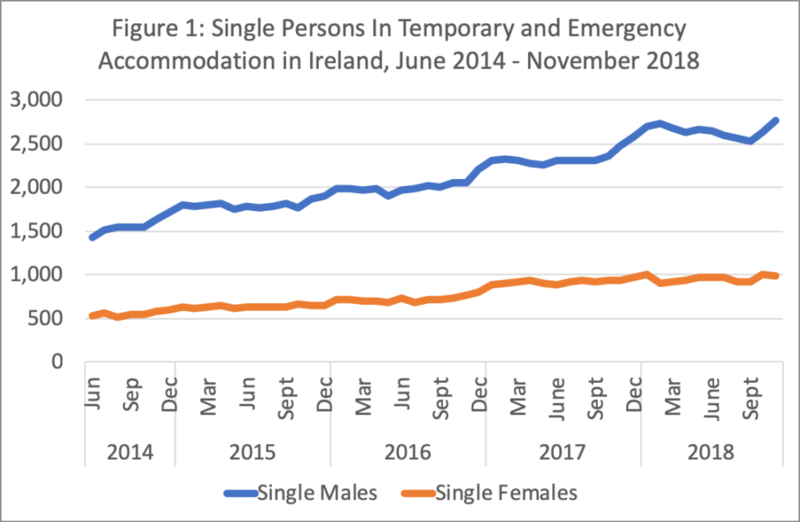 Thus, while the growth in family homelessness has generated considerable policy and media attention, the majority of those utilising temporary and emergency accommodation are single, and single males account for 45 percent of all adults in temporary and emergency accommodation in November 2018. Use of health and social services varies for the single homeless. Recent research2, for example, showed that the number of emergency hospitalisations among those experiencing homelessness has increased significantly in the last ten years and that the majority of these (57%) had a mental or behavioural diagnosis. Males outnumbered females by a ratio of 5:1 and the mean age was 40.6 years. A study of presentations to hospital emergency departments for self-harm acts between 2010 and 2014 across Ireland3, found that homeless people accounted for 3.9 percent of all admissions, and were predominantly male and living in Dublin. A further cross-sectional study in a large Dublin hospital4 identified a similar pattern, with males representing nearly 80 percent of homeless emergency department attenders, and a mean age of 39 years for all homeless emergency department attenders. Another study5 combining data on methadone treatment, self-harm and drug-related deaths also indicated an upward trend in numbers of NFAs presenting. The profile of those using emergency department services suggests that they are in the main, chronically or episodically homeless, a relatatively small proportion of the overall homeless population, but heavy users of various costly services. For the single homeless in particular, research6 shows how they traverse through a range of different institutions, from emergency accommodation to prisons and psychiatric hospitals, in an endless loop through an ‘institutional circuit.’ ‘A Vision for Change’ the current policy document on mental health services also notes this phenomenon identifying a drift between institutional circuits7 that include mental hospitals, shelters and the street. Gaps in provision include lack of access to appropriate services and the catchment based nature of mental health services. While the number of patients in psychiatric hospitals in Ireland has declined, more or less, continuously since the early 1960s from nearly 20,000 in-patients to 2,408 in 20168 a number of Irish studies have suggested that homeless people exhibit relatively high levels of mental health difficulties9 and may be over-represented in psychiatric settings. Longitudinal data and more rigorous research design, has demonstrated that approximately 10 percent of homeless people fall into a chronic homeless category10. Against the backdrop of increasing levels of homelessness within the Irish population, data from the HRB’s NPIRS were examined for the period 2007-2016 for those with NFA recorded. The NPIRS collects data on admissions to and discharges from psychiatric in-patient facilities both public and private. The NPIRS system records the address from which the individual is admitted i.e. the address at which the individual was residing at the time of admission to hospital. No fixed abode (NFA) is recorded if the individual does not have an address. Those admissions that had NFA recorded as their living arrangement were extracted for the years under investigation. The data were analysed using SPSS. There were 2,176 admissions recorded on NPIRS between 2007 and 2016 (Table 1) that had NFA recorded as their accommodation status. This figure rose from 188 in 2007 to 271 in 2016 an increase of 44% in that period. Numbers rose steadily each year with the exception of a small decline in 2010-11. The data show much larger proportions of males than females for all years (Table 1) and that of the cohort, over 70% were male. This is consistent with the PASS data for the last three years for the chronic homeless group referred to earlier and presented in Figure 1. Half of admissions were in Dublin (1,089: 50%). Most of the cohort was single (1,643: 75.5%). With regard to the age profile of those admissions with NFA, over one third (763: 35.1%) were in the younger 25-34 years age category and one quarter (568: 26.1%) were in the 35-44 years age category and 370 (17%) were aged 45-54 years on admission. Almost half (49.1%) of the admissions with NFA recorded in the period 2007-2016 were less than 35 years of age and over 90% (92.2%) were less than 55 years of age. Data on employment status show that not surprisingly, the majority of those within the NFA cohort are unemployed (1,640: 75.4%). The demographic profile of the admissions examined is consistent with the chronically homeless population referred to earlier. In NPIRS, diagnosis is recorded for cases on admission. Table 2 shows the main diagnostic categories for the NFA cohort. For the 10-year period, the key diagnoses recorded are schizophrenia (621, 28.5%), other drug disorders (333, 15.3%) and alcoholic disorders (257, 11.8%). This differs from the national profile of admissions where depressive disorders was the most common diagnostic category in 2016 at 27% of all admissions that year followed by schizophrenia at 19.8%. In 2016, the year for which most up-to-date data are available, the proportion of admissions for other drug disorders and alcoholic disorders were 5.5% and 7.3% respectively which are substantially lower than those for the cohort with NFA recorded8 . The NFA cohort, therefore differs from the national profile of admissions to psychiatric hospitals and units. NPIRS records the legal status of each individual on admission and whether an admission is voluntary or involuntary. The majority of admissions for the NFA cohort were voluntary (84.4%). As well as recording all admissions, NPIRS also records whether admissions were first admissions or readmissions. This is relevant when considering the range of options that exist for the treatment of mental health issues in the cohort with NFA. 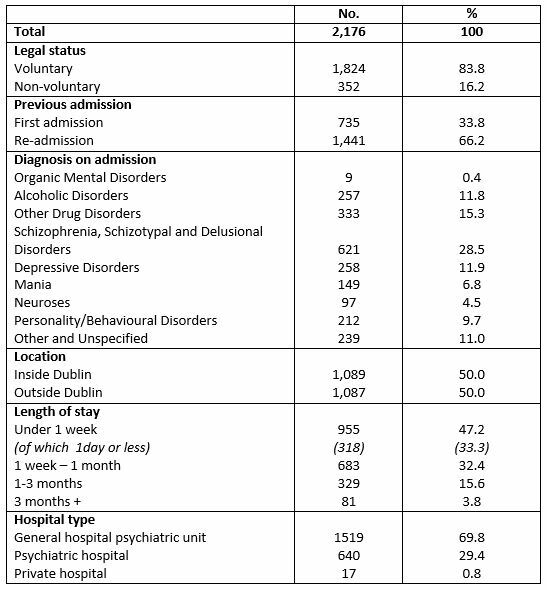 Table 2 shows that almost two-thirds (1441, 66.2%) of admissions in the period 2007-2016 were readmissions which suggests that the NFA cohort are availing of in-patient psychiatric services on a more than once-off basis. However, without a unique identifier it is not possible to establish the frequency of readmissions per person. Length of stay was examined for the NFA group to assess the time spent by this cohort in an in-patient setting. The findings show that a large proportion of the NFA group (955, 47.2%) remained for less than one week and of that number, about a third stayed for a day or less. When the year on year data are examined, the findings are similar to looking at the cohort overall. Table 1 shows that the majority of admissions with NFA are male and that this trend has not altered in the last ten years. 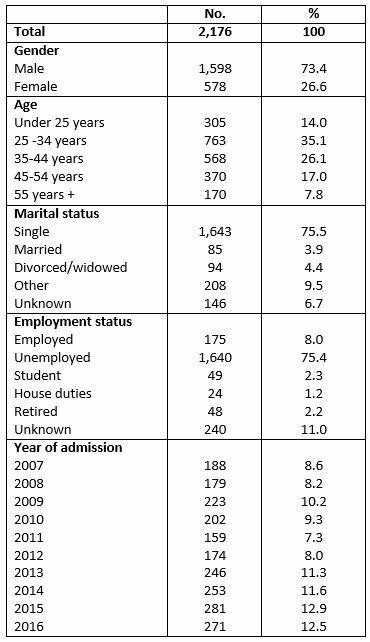 Similarly, the marital status of those admitted to psychiatric hospitals and units (see Table 1) is mainly single. With regard to the legal status of admissions for this group, most are voluntary admissions although there has been a increase in the number of involuntary admissions among this grouping since 2013. Similarly, there is an increasing number of re-admissions recorded on NPIRs for those with NFA since 2014, suggesting that the institutional circuits frequented by this cohort of the homeless population may indeed include psychiatric in-patient facilities. The NPIRS data show that the number of admissions with NFA recorded has increased over the last decade but that their characteristics are largely unchanged in the last ten years. Most of those with NFA were younger males, single and admitted for short periods of time, largely on a voluntary basis with diagnoses of schizophrenia or disorders related to alcohol and drug misuse. Their profile varies from the national picture of psychiatric in-patient admissions. Notwithstanding the limitations of the NPIRS that it is based on admissions rather than individuals, and that there is not currently a unique identifier, the research highlights the value of collecting routine administrative data over longer periods to help identify groups within the homeless population with specific health care or other needs. It also highlights the need for the implementation of the individual health identifier as a matter of urgency. Finally, the potential of administrative data to understand patterns of homelessness, to identify specific sub-groups and to respond rapidly to emerging issues is gaining increasing traction. In addition, understanding transitions, both developmentally and through institutions and services, is crucial in understanding homeless pathways, and administrative data has the potential to contribute to leading-edge research and to evaluate the impact of research on policy and practice. 1. O’Sullivan, E. (2008) Researching Homelessness in Ireland: Explanations, Themes and Approaches, In Downey, D. (Ed) Perspectives on Irish Homelessness: Past, Present and Future (Dublin: Homeless Agency). 2. O’ Farrell, A., Evans, D. and Allen, M. (2016) The epidemiology of emergency in-patient hospitalisations among those with ‘no fixed abode’ (homeless) 2005-2014: what lessons can be learnt. Irish Medical Journal, 109, 9. 5. Glynn, R W., Lynn, E., Griffin, E., Fitzgerald, M and Ward, M (2017) Self-harm, methadone use and drug-related deaths amongst those registered as being of no fixed abode or homeless in Ireland. Irish Medical Journal, 110 (9). 6. Hopper, K., Jost, J., Hay, T., Welber, S. and Haugland, G. (1997) Homelessness, Severe Mental Illness, and the Institutional Circuit, Psychiatric Services 48, 5, 659-664. 7. Department of Health and Children (2006). A Vision for Change. Report of the Expert Group on Mental Health Policy. Stationery Office: Dublin. 8. Daly, A. and Craig, S. (2017) Irish Psychiatric Units and Hospital Census 2016: Main Findings. Health Research Board: Dublin. 9. Keogh, C., O’Brien, K.K., Hoban, S., O’Carroll, A. and Fahey, T. (2015) Health and Use of Health Services of People who are Homeless and at Risk of Homelessness who Receive Free Primary Health Care in Dublin, BMC Health Services Research doi.org/10.1186/s12913-015-0716-4. 10. Montgomery, A.E., Metraux, S. and Culhane, D.P. (2013) Rethinking Homelessness Prevention among Persons with Serious Mental Illness, Social Issues and Policy Review 7, 1, 58-82.